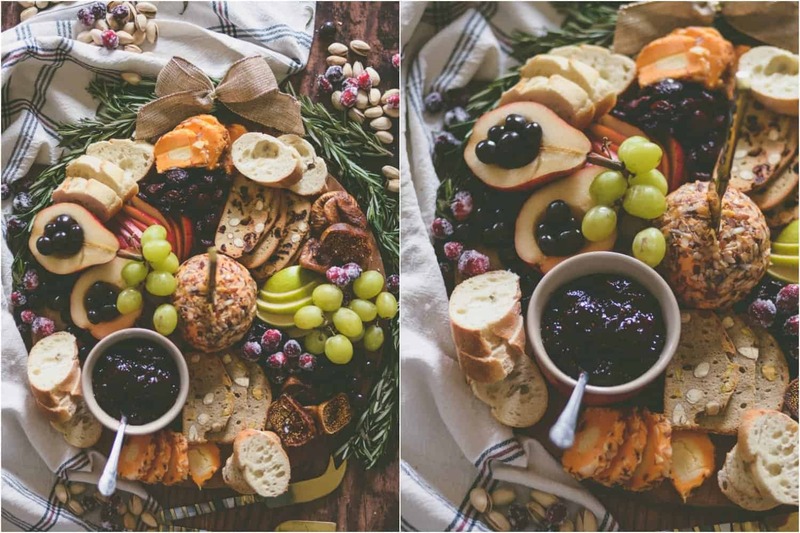 Everything you need to know about how to make an EASY holiday cheese board; including simple shortcuts, styling tips, and the one thing your cheese board shouldn’t be without! Kaukauna® was started in 1918 by an Eastern European man — Hubert Fassbender, up in Kaukauna, Wisconsin. He started a distribution company that ultimately became the Kaukauna® Cheese Company. He had a mission to create a cold-pack cheese that would be ideal for spreading on crackers and bread. Are we friends on Facebook yet?! 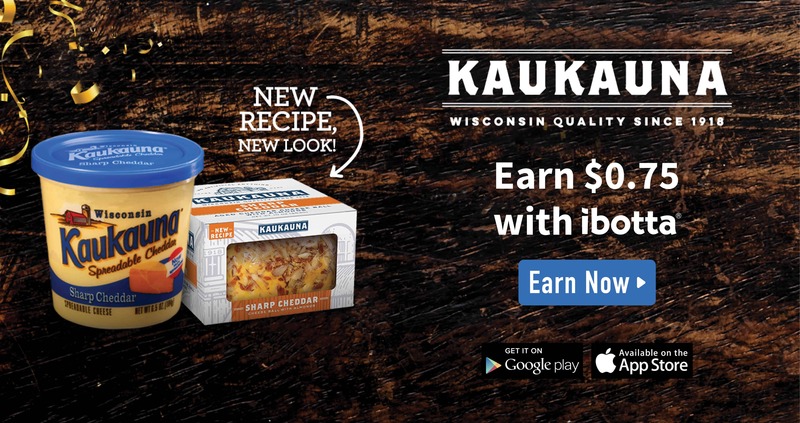 Kaukauna® is celebrating 100 years of being everyone’s favorite cold-pack cheese. 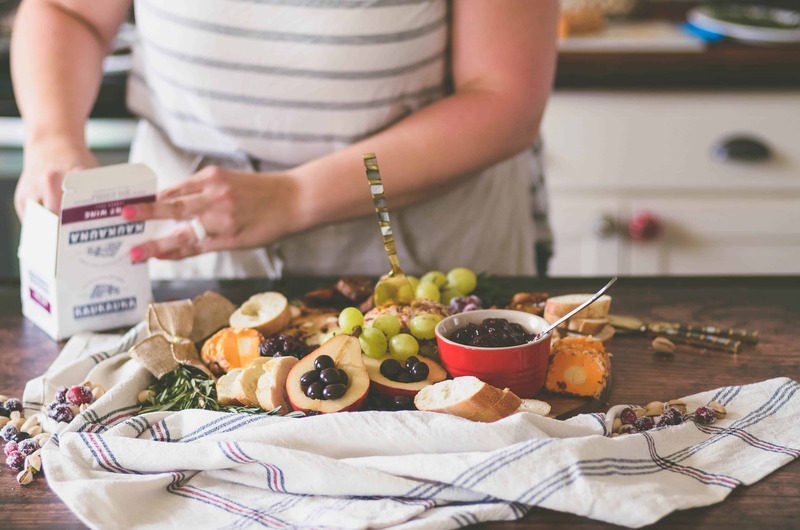 They’re excited to launch an updated recipe for two varieties – with no artificial anything – no artificial colors, preservatives or other ingredients! The cheese soft, spreadable, and so versatile, it fits at any table. Pears and apples are awesome for cheese boards. Especially since they come in a variety of colors! I used beautiful red and green pears for my holiday cheese board. Any kind of bread works well. Just do whatever is easiest for you! If you want to go the homemade route, this is an awesome recipe for REALLY EASY artisan bread. Again, feel free to go the store-bought route. Buy a yummy jam and scoop it into a cute bowl. 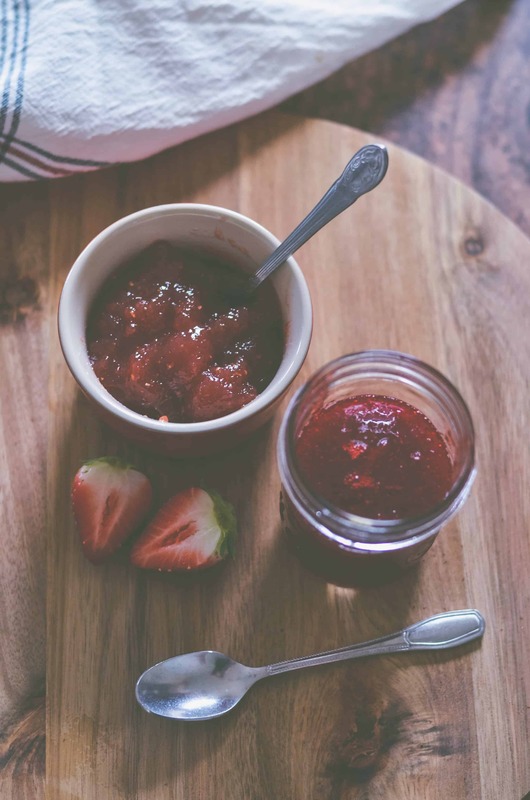 If you’d rather make a homemade jam, my go-to recipe for small batch MICROWAVE jam is at the bottom of the post! Pistachios, honey roasted peanuts, and almonds are my favorites. Chocolate bars, chocolate covered nuts, and chocolate covered fruits are all yummy options! I chose to include chocolate balls with soft, blueberry-flavored centers. 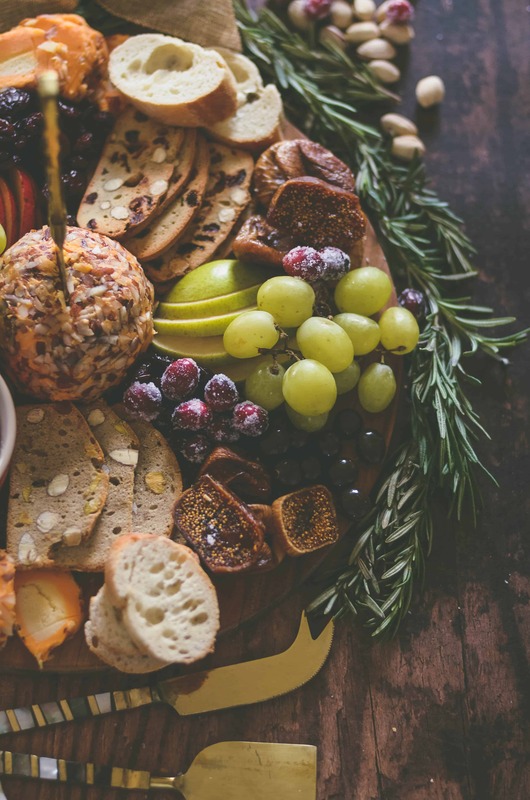 Just like sliced fruits, grapes come in a variety of beautiful colors, which makes them a delicious and vibrant addition to a cheese board! Be sure to cut the vines to create perfectly portioned clusters, easy for guest to grab. There are lots of varieties of thin and crispy cookies in stores. They are great options for dipping, pairing with fruits, and even eating with savory spreads like a cheese ball! Maybe consider making one of my sweet dips for your cheese board. The cookies I chose for my holiday cheese board are pistachio and cranberry flavored. Yummy and festive too! Just like the thin cookies, crackers are the perfect vessel for dips and spreads. Opening up a package of dried fruit couldn’t be easier, but they still manage to look so sophisticated! Dried cranberries, blueberries, and cherries are delicious and beautiful options. 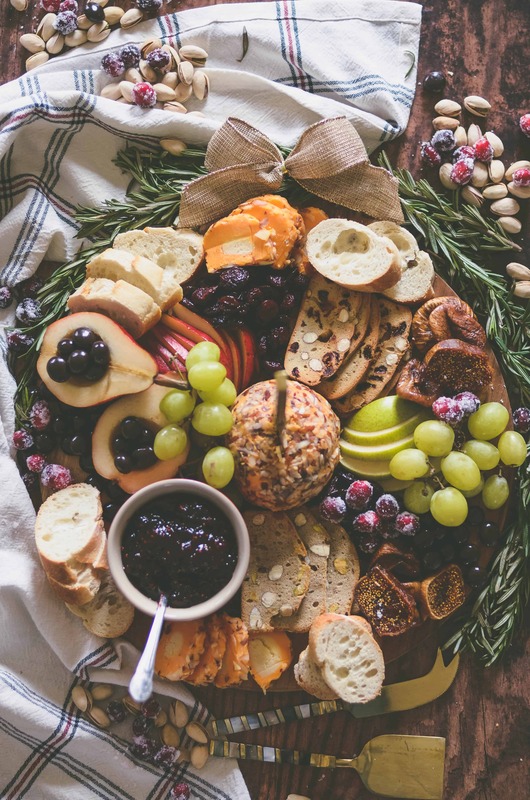 It really doesn’t take all that much effort to put together a festive and beautiful holiday cheese board. The “organized” chaos of the food arrangement is really where the beauty comes from. And, really, what’s easier to throw together than chaos?! The most important part of styling a cheese board is having a defined centerpiece to work around. 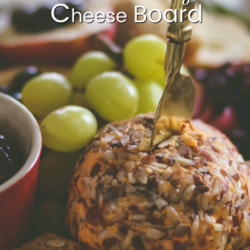 The Kaukauna® Sharp Cheddar Cheese Ball was the perfect focal point for the middle of my holiday board. After you have a centerpoint, all you have to do (more or less) is pile the rest of the snack food around it. Easy enough. Another styling tip is to slice some of the fruit in half to create a simple, elegant look that also showcases your food. I have two examples on my holiday cheese board– starting with the pears. I sliced some of the pears with eating in mind, of course. But did you notice the two pear halves that I left turned upward? Half of a pear isn’t necessarily the ideal portion to serve for snacking, but they serve a couple of purposes beyond eating. First, they draw attention in a decorative way to the slices of pears meant for eating. It’s like pointing an arrow to the pear slices with a neon light that says, “eat me!” And second, I scooped out the middle sections (I used a melon baller) and filled them with chocolates. Because I’m so fancy ????. The second example on my board of sliced and “exposed” fruits would be the figs. This is a trick I picked up through food photography. Sometimes a food isn’t easy to identify immediately with just a quick glance (a dried fig or a date, for example), especially when camouflaged by other foods. Slicing a piece or two open through the center and displaying them makes it easier to identify these types of foods. Use “loose” foods like nuts, berries, and grapes to fill in any awkward gaps on the board. Watch the video below to see what I mean. Did you see how I used the grapes to fill in the empty spots where nothing else would fit? And then I used the pistachios to fill out some of the empty space around the edges of the board. Easy peasy! I added rosemary sprigs and a burlap bow around the edges of my round board to make it look like a wreath. I loved the fragrance of the rosemary. But if you have other greenery, definitely just use whatever you have on hand to re-create the look. This board literally took me about 10 minutes to throw together, and I couldn’t have been more thrilled with how beautifully it turned out. 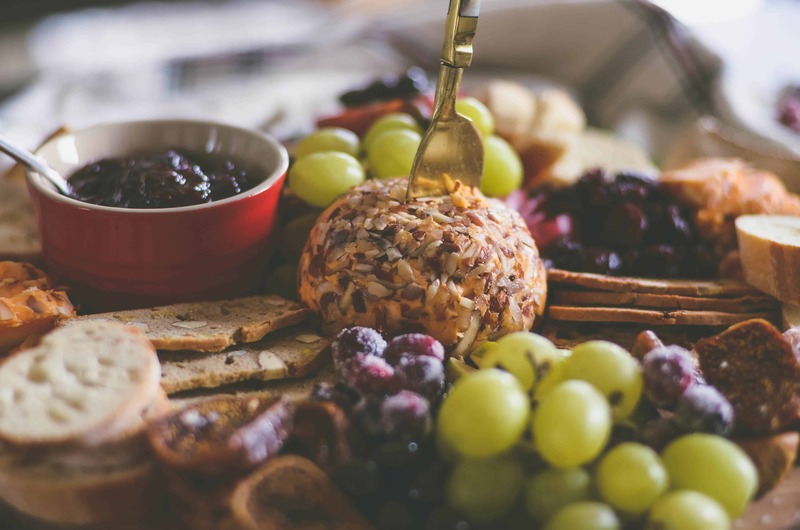 As long as you have a Kaukauna® Cheese Ball in the middle, you really can’t go wrong with a cheese board for all of your holiday entertaining! This jam recipe is perfect for making a small, easy batch in just 15 minutes of active prep time. It is deliciously sweet and perfect on just about anything! You can really sub in any fruit (or combination of fruits) that you like. I'm very partial to strawberry peach! Mix together all of the ingredients in a large mixing bowl (to allow room for the mixture to bubble up). Microwave for 5 minutes. Remove and stir. Use a wire whisk to mash berries further if needed. Microwave for 5 more minutes. Let cool for a few minutes before transferring to a jar. Mixture will thicken as it cools. Delicious served warm or chilled!